Omg! Love love love this outdoor carpet! I bought a smaller one of these last year for an area in my backyard. Liked it so much bought the matching larger carpet for a different spot in the yard. This sunny and sensational collection of flat-woven indoor/outdoor rugs is pretty, practical, and perfect for high-traffic areas. With its inviting assortment of classic and contemporary designs, tempting color palettes, and terrific textures, these multipurpose rugs will afford an air of simple sophistication to any environment. A pretty and playful pattern of leaves and vines really turns on the charm when presented in alluring aqua and appealing ivory. This 100% polypropylene, engagingly textured indoor/outdoor rug will bring a fresh and fabulous flair to any environment. Easy cleaning and maintenance - just rinse with hose and air-dry. Ideal for heavy-traffic outdoor areas. . Pile height is .25 inches. This outdoor area rug is so very beautiful. I live in an apartment that has a screened-in patio that I was trying to dress-up. I brought a white bistro table that had round seats. I brought the rug to match some round seat cushions. The rug and the seat cushions match perfectly. One of my building complex maintenance men told me I had the prettiest patio of all the apartments he has been in. 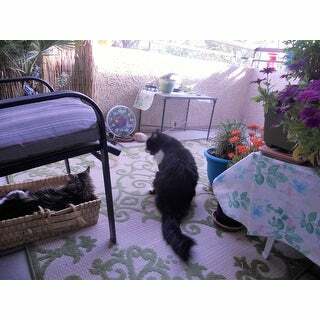 It is the rug that has made the patio stand out. 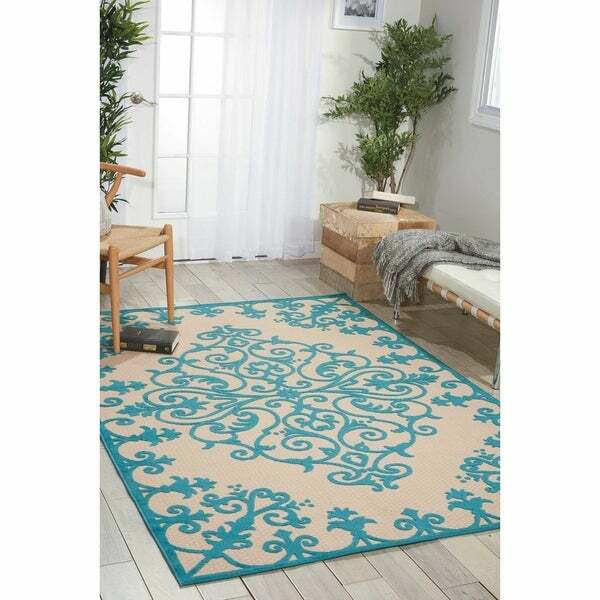 Option: Aqua - 5'3" x 7'5"
This rug is in our sunroom, so far it's handled water and dirt and cleaned up easily. Not solid plush but almost like the backside of a woven carpet with the plush fiber design. I love the teal/aqua color. 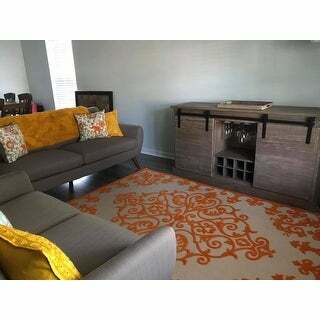 Option: Green - 5'3" x 7'5" | Orange - 5'3" x 7'5" | Red - 5'3" x 7'5"
I ordered this rug in 3 colors and love it in each room! Option: Aqua - 5'3" x 7'5" | Green - 5'3" x 7'5"
It's beautiful and true to color. 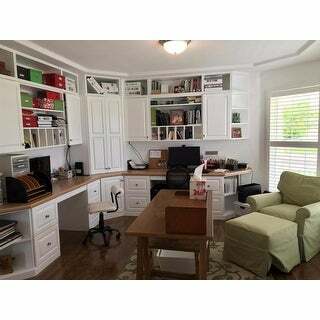 The green is nice and neutral. My cats love it too. 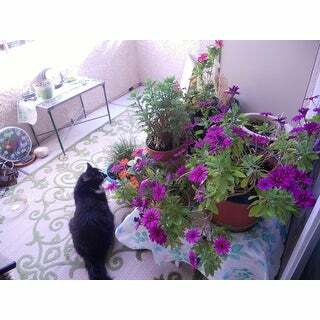 It's on the terrace with flowers and plants so it looks like a plant in a way. The swirls are upraised and soft to walk on, like embossed. Very happy...I looked for over a year for the perfect re-placement of the other outdoor rug, also from Overstock. I went from black swirl to green. I love the change. Option: Navy - 5'3" x 7'5"
Lovely rug....Great choice! Beautiful pattern ..I love that this rug is indoor outdoor! This rug is beautiful. I got the Aqua/Teal the color portion of the rug is raised and soft, for an outdoor rug it is stunning, but we did consider using it indoors because it was so pretty. Option: Red - 5'3" x 7'5"
This is my third rug of same pattern ordered for my porch. Two have been on a screened in porch for a year and today I added the third one. Colors still match and the all look the same. Easy to keep clean with broom. Option: Navy - 5'3" x 7'5" | Red - 5'3" x 7'5"
I purchased two of the red area rugs for my new house. The look is fantastic; and, the quality and ease of cleaning is wonderful; however, I lowered the rating from 5 to 3 because the manufacturer rolled the rugs with the wrong side out so the edges will not lay flat! A definite tripping hazard. I have purchased many area rugs in the past but this is the first time I have seen this happen! This is a real issue due to being a senior citizen with health issues. This is a very pretty rug. I am very please with the quality of the rug. Loved this carpet when new........ sun faded it terribly.. sad. We love this rug! The red pops so much and adds a unique vibe to our patio. It is in a non-covered space so it will be interesting to see how it holds up through rain and Houston summers. First initial impression was great though and you cannot beat the price!! I use this with my vintage Airstream, it is often moved, and used under a variety of situations. It's easy to handle, roll up and store. Rinses off easily. Bought one for my home & one for my daughter we both loved it. It wears very well with all the foot traffic. Great looking rug for the money. Holding up well after one summer on a west facing covered deck! Ordered a second smaller size to go under the outdoor bar and stools - looks great together. This is a pretty rug but the glue on the edge has come out and does not look very nice. The colors are pretty but I have had other rugs that look better and don't come apart like this one. This rug arrived and it is just as beautiful as pictured! This review is being posted after surviving all seasons including a winter in Colorado on a covered porch - still looks like the day I received it! 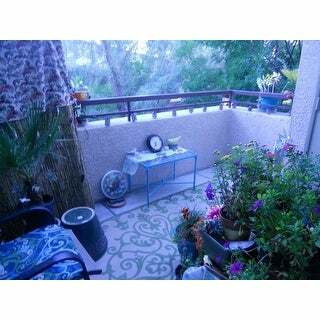 Option: Green - 5'3" x 7'5"
Love this rug, I purchased the green area rug for my deck. It looks and feels very nice. It compliments my furniture! Perfect rug for a patio. Great size and nice, bright color. We use it for our smaller sitting area on the patio. Works well with the two chairs and bench on the outside of the rug and a nice size coffee table in the middle. I use this on my front porch. Easy fo clean. Color had not faded even though its in the sun at times. It's a very nice color, we enjoy it. "Has anyone experienced any fading from this rug? I have a sunny back patio. Thanks!" My rug is under a pergola, so it gets minimal sun. The little sun it gets has not faded it over two summers. It definitely fades. Within two weeks, my red rug has turned orange. I like orange, so it's not a huge deal, but I can only imagine what would happen to some of the other colors. "Can you leave this rug out all year long? Even during snowy winter?" I leave my rug out all year long on a covered patio. It gets wet from the rain blowing in and dries out and looks just as good as when I took it out of the box. I don't think I would leave it out all year with no protection from the elements, but it would be easy to roll it up and store it away for those snowy months. Yes this rug is durable enough to leave outside in any season. "I need a rug to go on my hardwood floor. It cannot have a hard woven or rubber back. 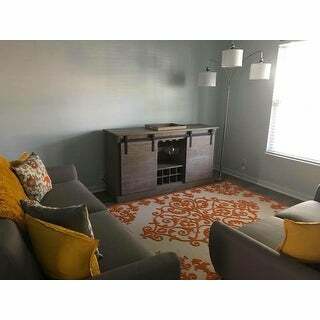 Can you tell me what the backing of this rug is?" 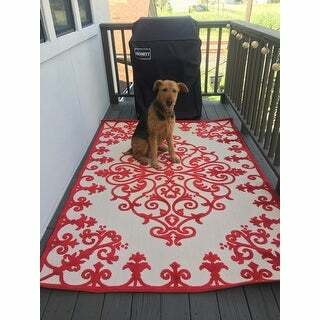 I have three of this specific rug in different sizes..I use them all outdoors and love them. There is no backing on the rug...it is just the reverse side stitching of the pattern on the top...no rubber backing or cover to stitching. Lies very flat and the colors are vibrant. I think it is a little on the hard woven side. It's a beautiful outdoor carpet, but I don't think it would be good for a highly polished wood floor. "How does one clean these rugs in case of spills? Are these rugs able to just be hosed off?" This rug is so easy to clean. Just take it outside and hose it off. 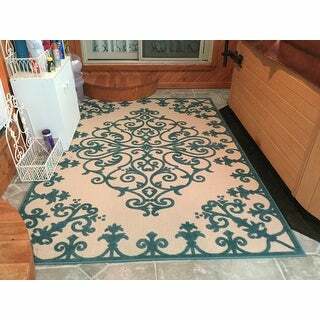 I love the design and color of this area rug. I will look smashing with my white patio set. The color and the price!